Utopia Tica Sustainable Lodge is located 200 meters away from the entrance of the Corcrovado national park "el tigre" trail which is in the village of Dos Brazos del Rio Tigre, 14km of Puerto Jimenez. Nested in the heart of the intense natural beauty of the Osa Peninsula in Costa Rica, our lodge offers private fully equipped cabinas and “open air-river front dormitories”, private single bed room, and double private rooms, with all the kitchen amenities, featuring dry-compost toilets in all of our facilities. We recycle, compost and reuse all the gray waters. For this reason, we request for only biodegradable products to be used in our facilities, we offer them on site if needed. 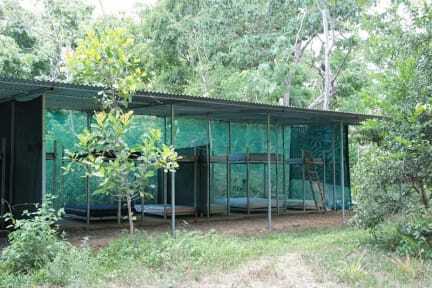 Tours can be booked from the lodge to the Corcovado national park (we are located in front of one of the 4 entrances), as well as different tours leaving from our place; trail walks surrounding the park, gold panning tour-experience, several options for kayaking tours and whale watching in Puerto Jimenez. There is also several hikes you can do on your own and waterfalls to visit in our small village along with amazing views. Another sustainable feature in our lodge is the option to order breakfast (8$) and dinner (15$) on site. The ingredients we use for our guests are ethically sourced, local and organic. We support small scale family farming and sustainable agricultural practices. 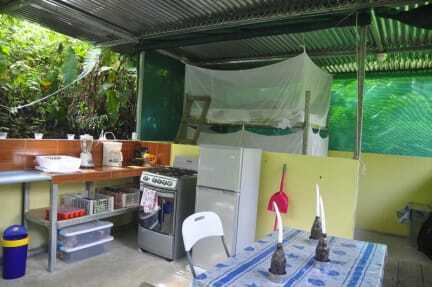 We offer homemade recipes meals powered by the costarican project OrganikaCR. (www.organikacr.com) . On site we also offer bulk, package free, nonperishable food items for you to cook your meals. Limited 3G internet is offered during the daytime (8am-18pm) in the community area. To confirm reservation full Payment needed via paypal 30 days before arrival . Please contact us to send you the paypal email account. An invoice can be send by message via hostelworld or directly by email." Taxes not included - 13.00%. Cancellation policy: 30 days before arrival.